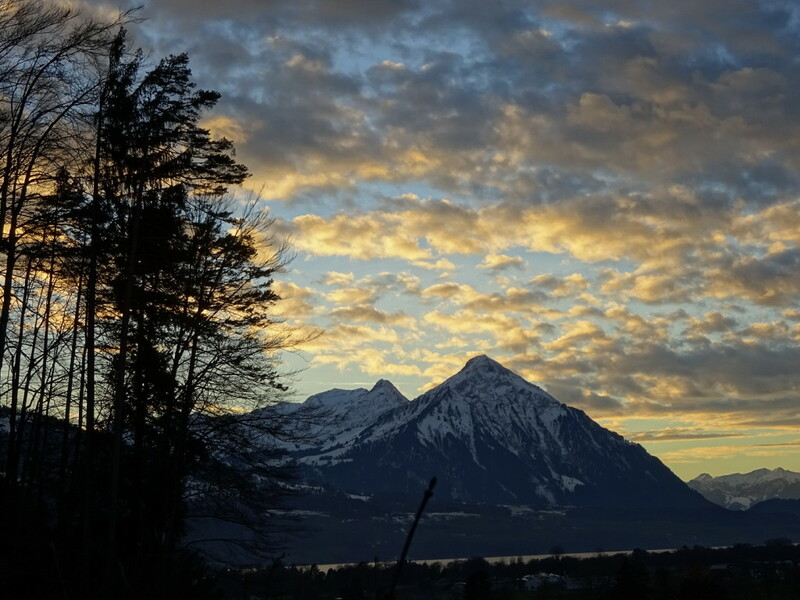 Posted on December 28, 2015 by No Map Required Posted in Places, Switzerland	. Leaving Switzerland, our friend Matt announced, “Man you guys have had jam-packed days! Jam. Packed! You did SO much….especially considering you didn’t get out of the house before noon.” We’re taking that as a compliment and an example of doing things ‘the right way’. We would also add, we really did do a lot considering Switzerland is closed the last week of November…but we’ll get back to that in a second. 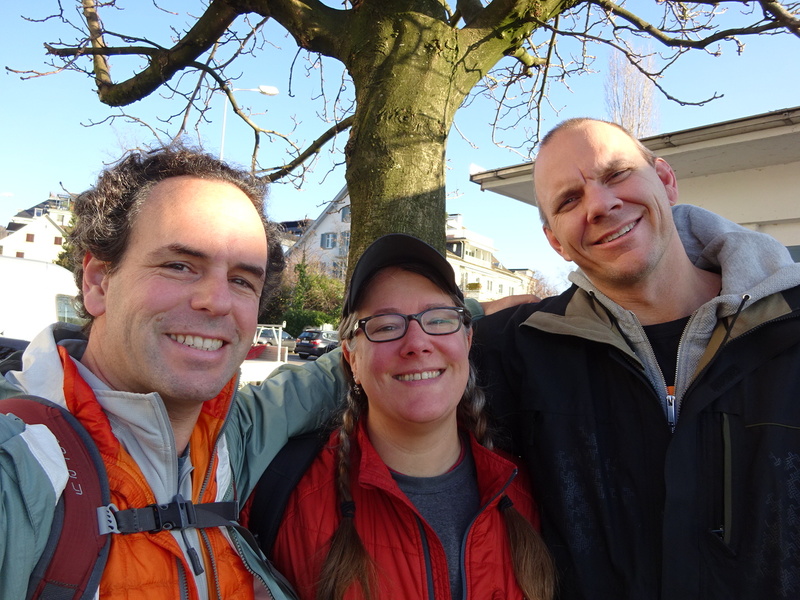 Our last day in Zurich with my friend and ex-coworker, Matt Miller. As soon as we knew we were going to Europe, we knew we would visit our expat friends Matt, Christy and their boys. They left the States a few years ago on a dream of taking their kids to a new country, teaching them new languages, and showing them the world. We were quick to cheer them on and attended the going-away bash. When we announced our Big Trip, Matt was one of the first to reach out to us. When we realized we had just enough time between Barcelona (blogs to come) and our house-sit in Lubrin to go visit them, we went for it! Luckily Matt and Christy were willing to take us in on almost no notice at all. Their couch was our couch and we thank them! Matt had warned me, but really there’s no warning realistic enough to do it justice: OMG Switzerland is unbelievably expensive! Hear me now: you can’t possibly afford to visit Switzerland. Skip it and head straight to Germany. Unless you can stay with Matt, and then you can probably juuust eak by. Thirty dollar burgers and we’re not kidding. That’s not at the fancy steakhouse…that’s at the food truck. Swiss people, who do you think you are? A bunch of financiers? Oh, wait… We only realized after we arrived that we would have never been able to afford the visit except for our deluxe sleeper sofa experience. Most affordable thing in Zurich is this selfie. Our Swiss Trip was decidedly weird and ridiculous prices were just the start. We love traveling in off-season everywhere we go. Typically it means no crowds, more vacancies and lower prices (Lower prices? No such thing in Switzerland!). However, it turns out that for Switzerland, the last week in November and first week in December are particularly bad. Everything from summer is closed down and nothing for winter is open! Might be different if they had strong early snows, I guess, but not this year. We had no idea. Not a chairlift, gondola, sledding run, ski slope or funicular to be found open on December 1st. Nada. Zilch. Zero. And believe me, we looked! That wouldn’t stop us from exploring, though! When we think of Switzerland we think: snow, skiing, Matt & Christy and chocolate (not necessarily in that order). I think we ticked most of the boxes in spite of the cost and the close-down. Fun follows us, after all, and we didn’t want to let Fun down. First we woke to kids yelling, “It’s snowing!” With that announcement we checked the snow box! Ahh, we thought, how perfectly Switzerland. Plus, I don’t know how many years it’s been since I woke up to snow. It was fun for one day – then it warmed up just enough to be cold and rainy. SNOOOOOW! 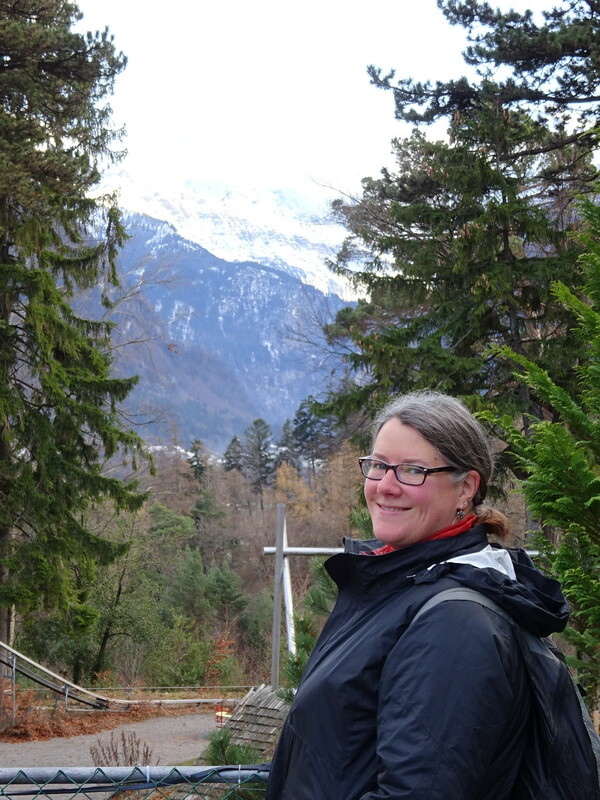 (Technically this was the start of our hike in the town of Interlaken, but it’s our only snow photo.) It was chillier than that amount of snow would have you believe. 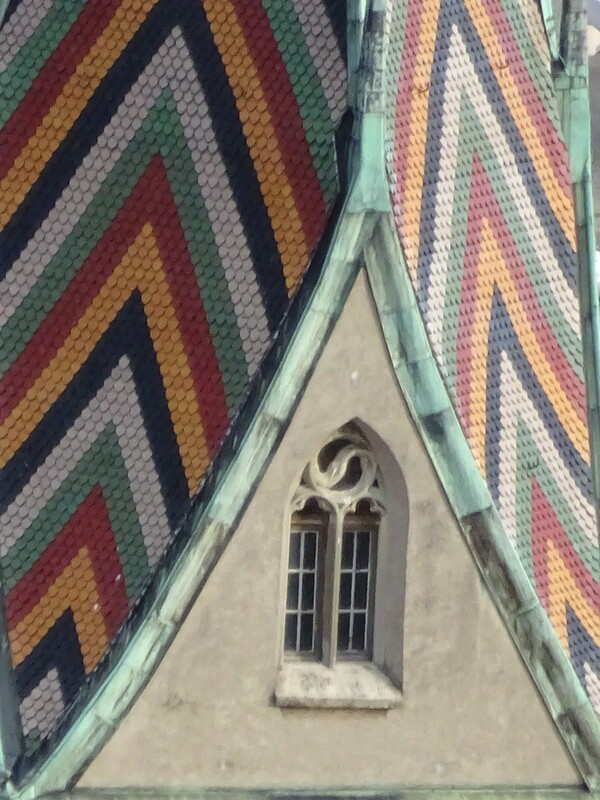 In Zurich we walked the most expensive mile in Europe. Want the perfect complement to that $9 cappuccino. How about a $100,000 watch? No? A $200,000 one? Yep, they’re available. The Swiss love their watch shops! Block after block of watches. Aaron studied them all and in the end we decided the only watch in Zurich we could afford was a SwatchWatch. Maybe. Zurich is full of expensive, fancy things, but it’s also really charming. Clock towers everywhere. Gingerbread architecture. Little bridges over the river (yes, a river runs through the downtown area). Swans a swimming…geese a laying. We got off the big street and wandered the deserted, mostly shuttered, back streets and that’s where we found some really wonderful little stores and friendly people. 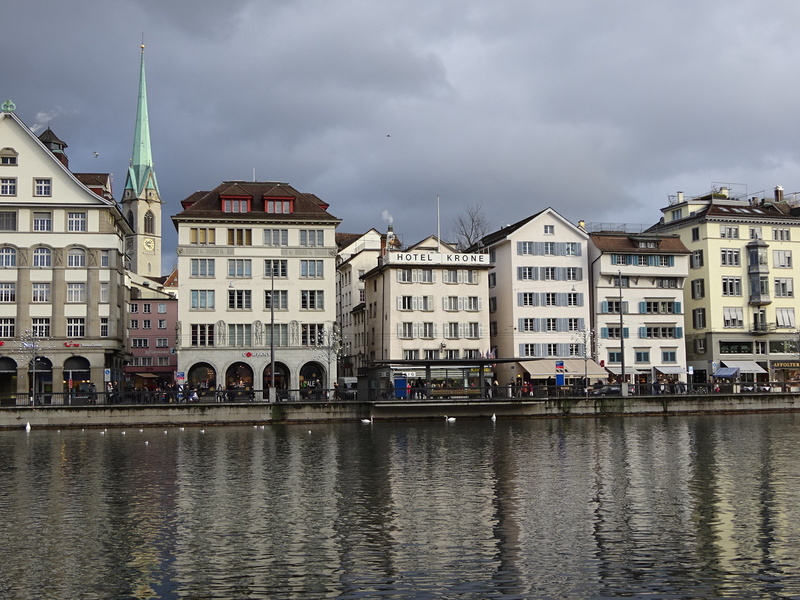 The Limmat River in Zurich was nothing less than picturesque. 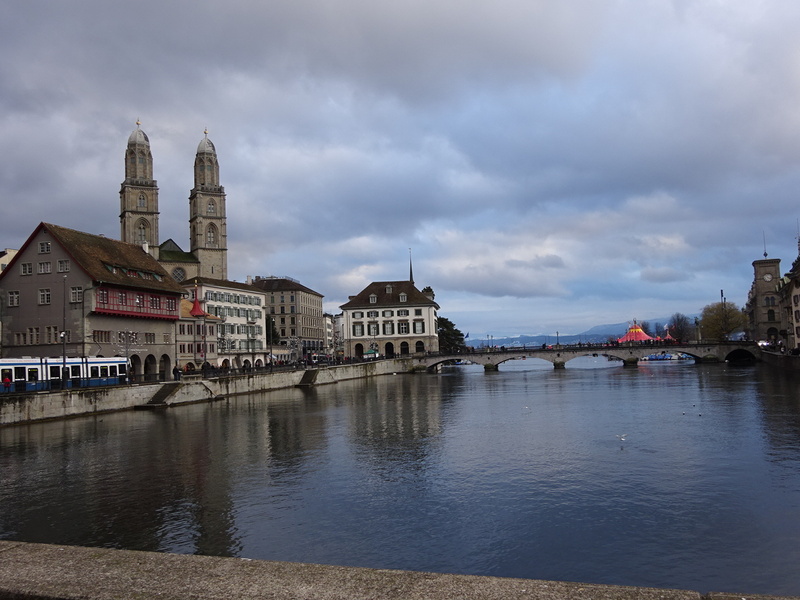 Another view of the Limmat. Sweet. Right? A pretty quaint neighborhood on the way to the textile museum (more on that coming right up!). Loads of people biking and jogging in Zurich. Could not resist this beautiful red on a very cold, gray day. One lucky find was a restoration/antiques/jewelry shop called VOCK. 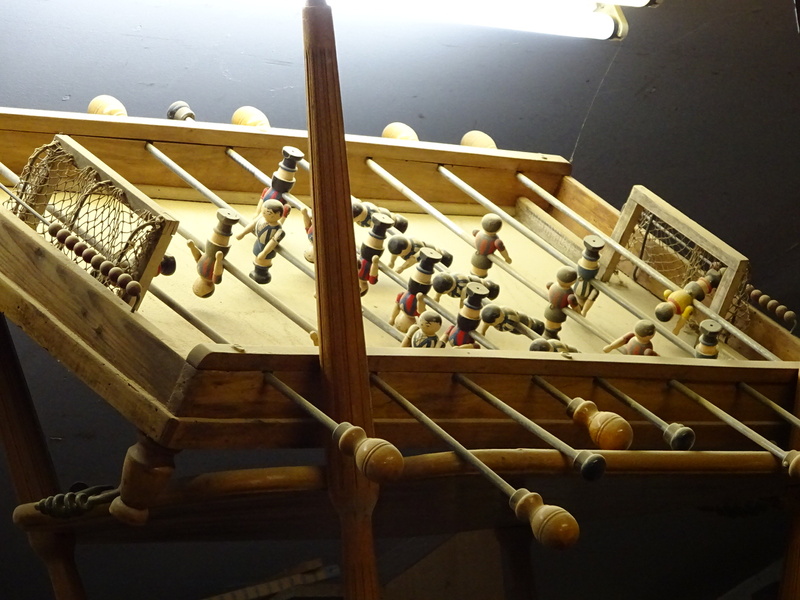 It was the super-fancy 1930’s restored foosball table that attracted us – GORGEOUS! At $45,000 or so, it’s the “Rolls Royce of foosball tables” and looked worth every penny. Unbelievable. Anyway, upon entering we met the nicest woman, Betti. She is the third generation at this restoration shop. Her brother takes in old pieces of furniture and restores them to their former grandeur for re-sale. Herself, she makes silver jewelry. 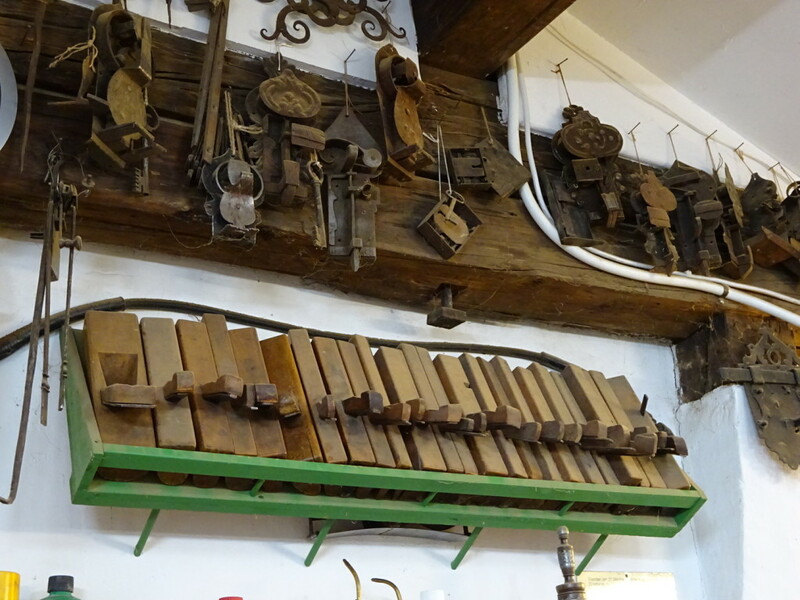 Their combined workshop is pretty incredible + it has loads of the old tools from Betti’s grandfather who started the shop. Old tools are one of those things that are often so much better than what we get today. Aaron was just in *love*. 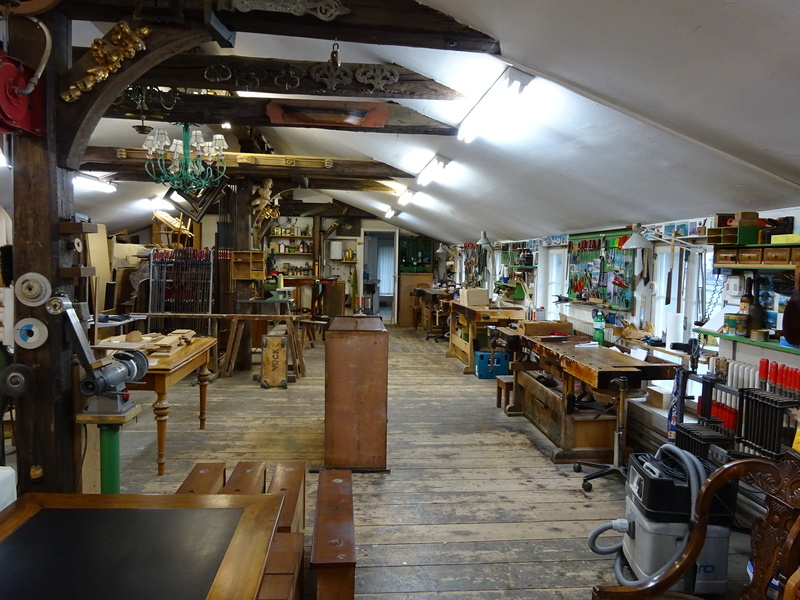 Even though the workshop is normally closed and pictures aren’t allowed, Betti gave us a tour saying it was perfectly fine to capture a few memories. We really enjoyed talking to her and some of the other shop owners. As always, the people were the highlight for us. Oh, man – want this! 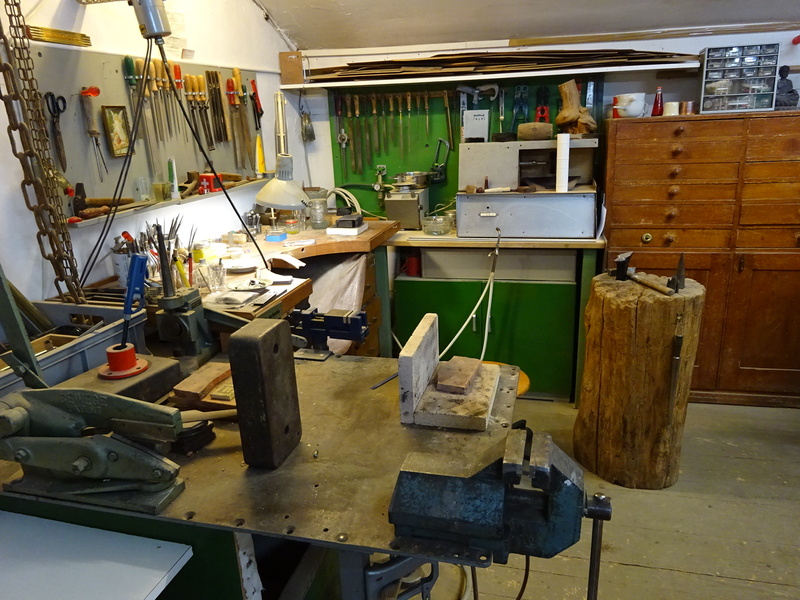 Pretty darn nice jeweler’s bench and area. An old table-top foosball game awaiting restoration. Wish we could have taken a shot of the fancy version, but just didn’t feel right doing it. MAN it was nice, though! I’m pretty sure we hit every single chocolate shop in the old town part of the city. We started to get snobby about it – if it didn’t smell chocolatey with the first whiff we just turned around and left. Hmm, wonder if I should I feel bad about that? I’d like to tell you all about our chocolate tastings, but if coffee and burgers are expensive, just imagine the price of chocolate! $20 for a little bag of nonpariels. That’s not even the good stuff (unless you’re Aaron and then that is the good stuff). One night we picked up dinner at a grocery store (there food WAS affordable) and they had a wall of chocolate bars. Seriously. A wall! And we’re not talking Hershey bar size, we’re talking the big, good ones. Most ran from $4.50 – $15.00, but in the bottom corner there were chocolate bars for $.50-.85. That’s right – less than a dollar for a big bar of chocolate. For that price how could we not take a chance? Let me just say, Switzerland’s cheapest, bottom-shelf chocolate is better than 99% of the expensive chocolate we’ve tried….and we’ve tried a lot of chocolate in this marriage of ours. And with that delightful discovery we quickly stocked up. Four bars of dark chocolate, a couple with nuts, one or two milk for gifts… check off the chocolate box!! 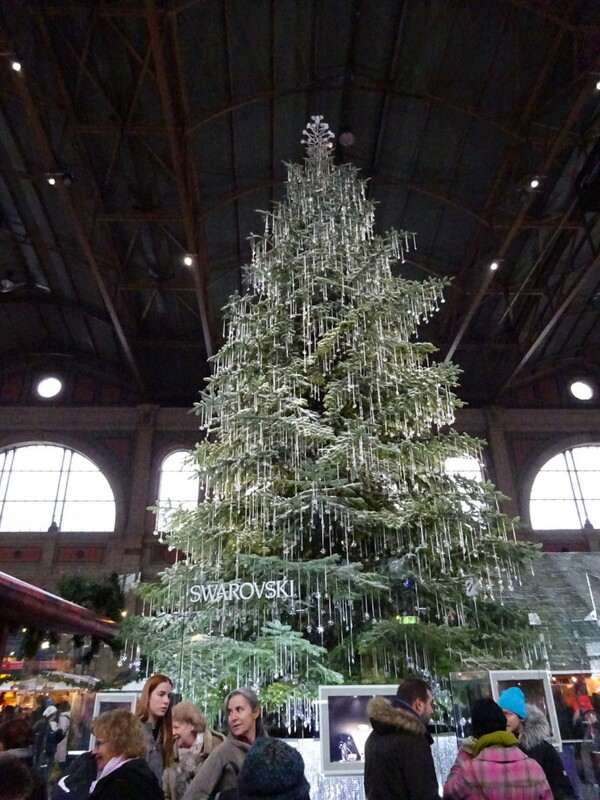 A humongous Swarovski Crystal laden Christmas tree in one of the markets in Zurich. All those boxes at the bottom are actually display cases with Swarovski jewelry ringing the tree. I shouldn’t have been surprised, but I still was. 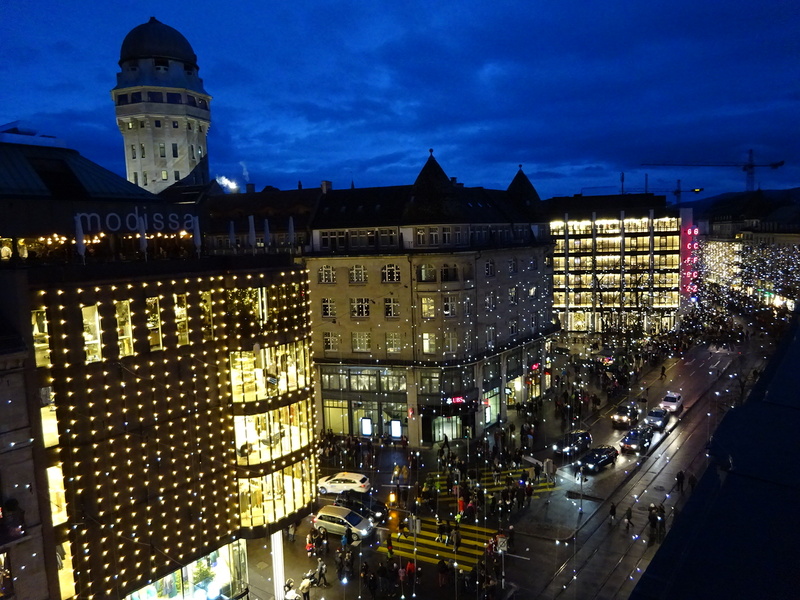 We arrived in Switzerland for the first Sunday of Advent which meant the shops were open when normally Zurich is closed on Sundays. Nothing says “Merry Christmas” like a lot of consumerism. Watch, anyone? Happily the Christmas lights were turned on and shining pretty darn magically. At one point we happened to be in juuust the right place as a tram rolled up and it emptied out one Santa’s helper after another. 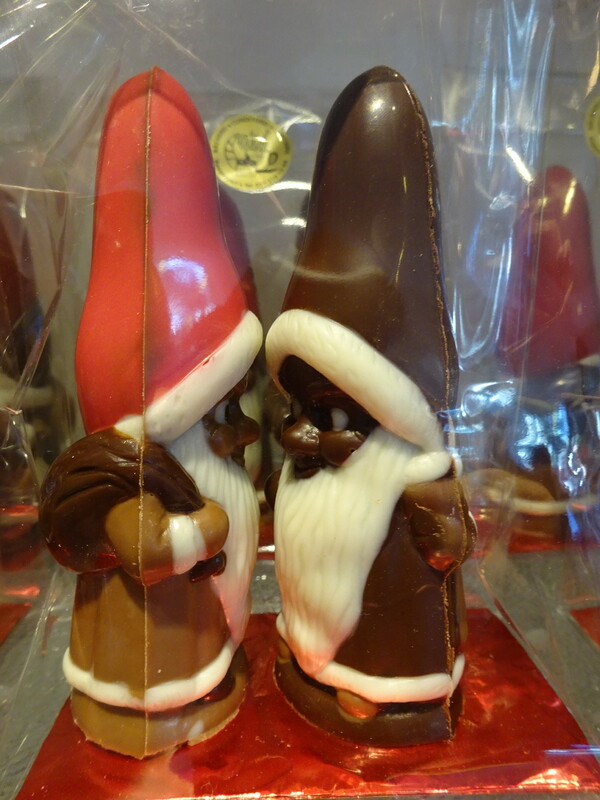 In Switzerland there are two types of Santa’s Helpers – red ones and brown ones. The red guys leave presents and the brown ones coal. There were a LOT of brown guys so I guess there are a lot of naughty financiers in Switzerland, but they can afford the watches so maybe they don’t really need the red helpers. The two types of Santa’s helpers. These guys were in a local chocolate shop, but too rich for our blood, so I just snapped a photo when no one was looking. On this day, lights get turned on and choirs in the “Living Christmas Tree” sing, which was super-duper-cute to start with until Aaron started to attempt to sing like a choirboy. I think I got him out of there before anyone’s mom could hear him. International incident: Averted! 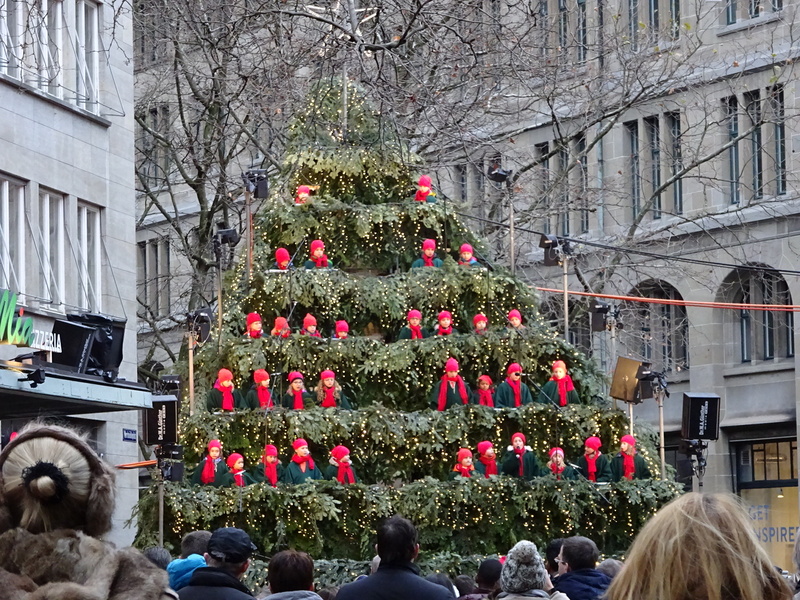 The Living Christmas Tree…throughout the season different groups get up there and carol to the crowds. Gotta say, from a distance it really did look like a tree. The night ends with a parade and Santa’s helpers roaming the streets. Not snow on the right side of the photo…it’s strung lights made to look like snow. The next day we headed to the Bellerive textile museum and a chilly walk along the lake. 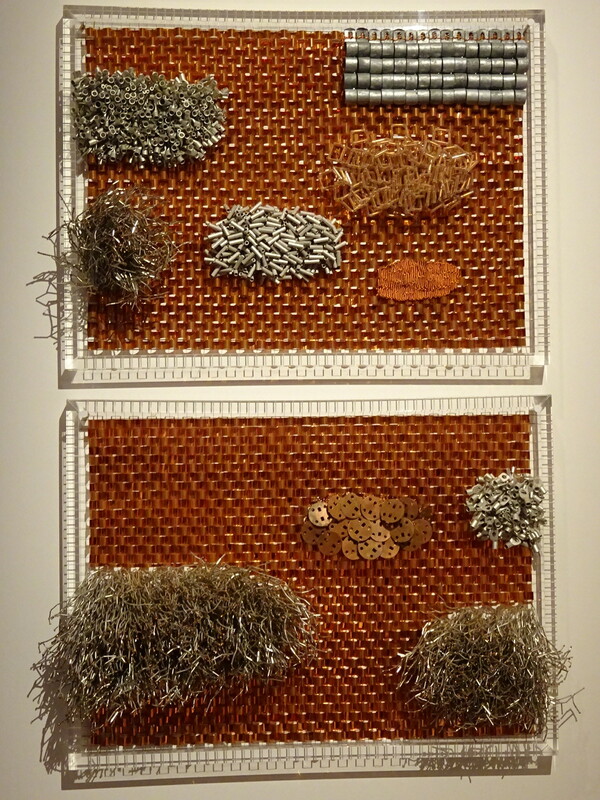 The museum challenged us to really think about what makes something a textile. 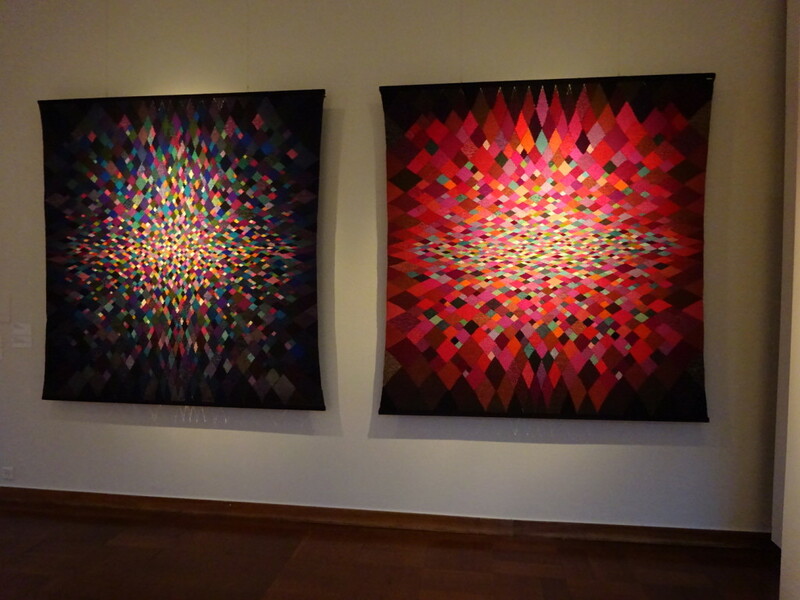 Couldn’t understand a lot of the descriptions, but still very much enjoyed seeing the art. You know art – it transcends the language barrier. 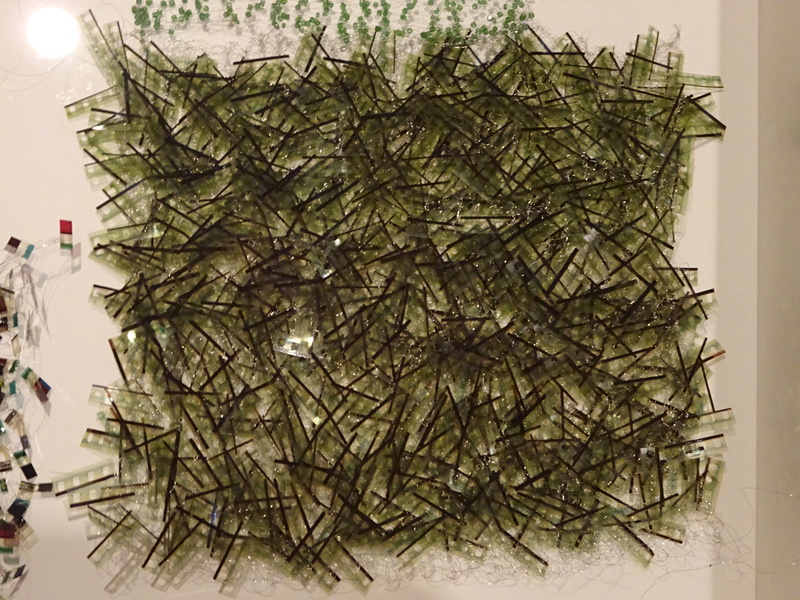 Kind of more what I think of when I think textiles…fabrics made to look a certain way. Then there was this. It’s woven copper with metal findings added to the base layer. Reminded me of Aaron’s metal basket weaving in Ecuador. Aaron had an appreciation for how difficult this is to execute. Pretty much gotta be over forty to know what this is. Look closely…. snippits of film. You know, the kind where photos used to come from. Cool! 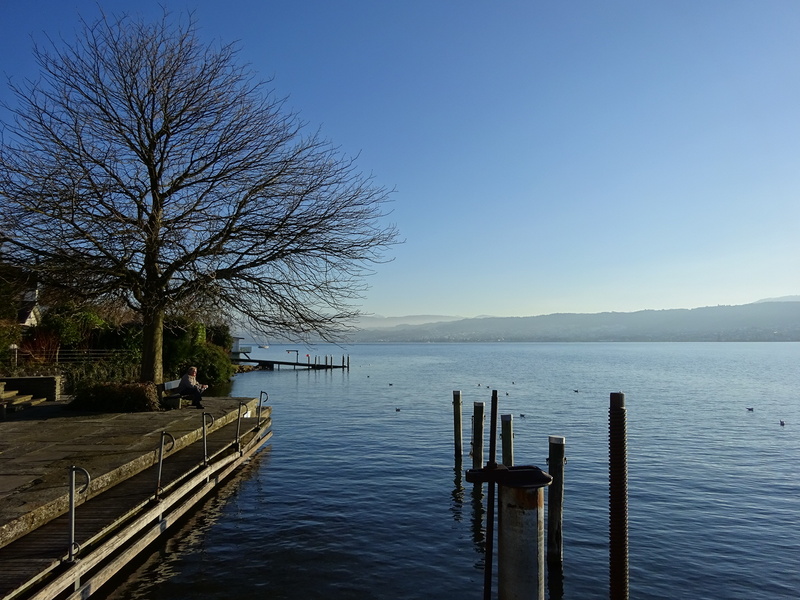 After a couple of days exploring Zurich, we decided to get out of the city proper. 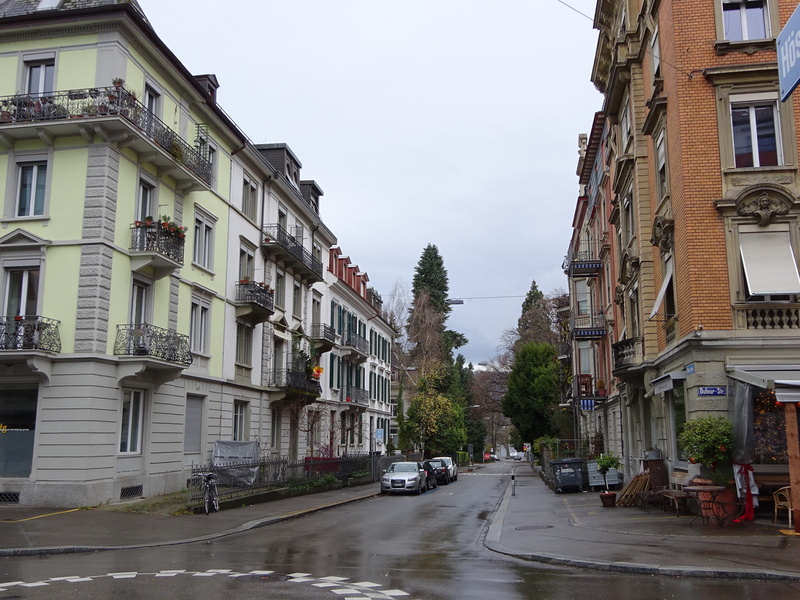 In another last minute decision we headed out on a 15 minute train ride to the town of Baden. We thought it would be fun to explore a little town and there was one specific street art gallery we wanted to see. It was a Monday and apparently Baden doesn’t open until Tuesday. Not just the theater and museums were closed, but about 50% of the shops. 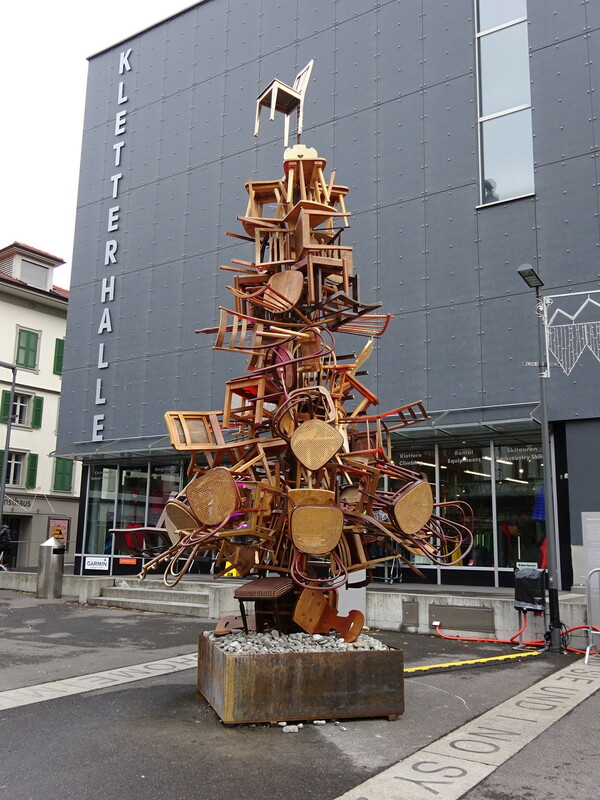 Sort of the story of our visit to Switzerland! We went for a little urban hike as we searched out the street art gallery, fingers crossed that it would be open. It was, of course, closed. We pressed our noses up to the windows and got a pretty good view anyway. I’m sure we looked like complete goofs, but we had come so far! Maybe next time. Feeling slightly unaccomplished, we hiked up to a view point and watched the holiday lights come on. Have to say: lights are different and more interesting in Europe. They are kind of like big light sculptures threaded between the streets. Very, very cool! They all move in the wind which gives it a whole new dynamic – like a big snow ball or snow falling. We ate pretzels (sometimes called bretzels) and hot dogs. The pretzels are delish! Missing those already. They weren’t on the list, but go ahead and check ’em off anyway. Hello puppy-dog! 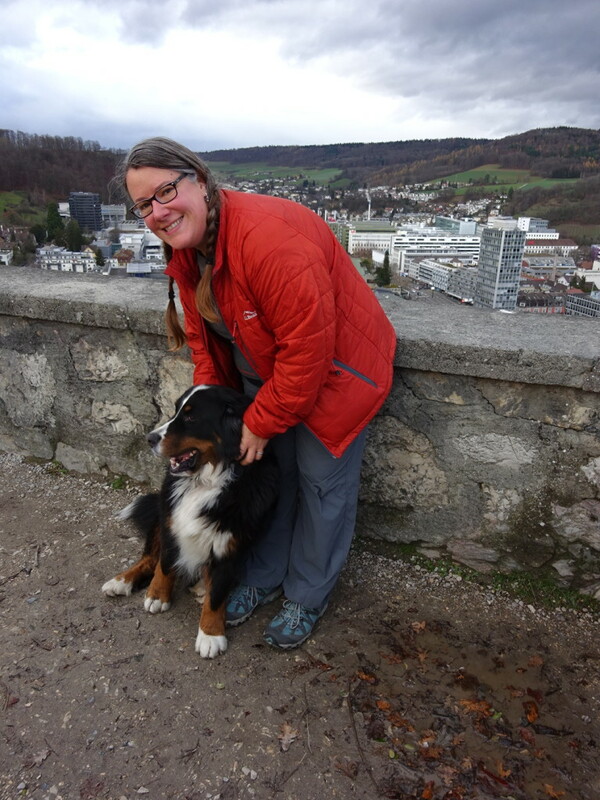 Checking out the view over Baden. On day three we decided to head out to the Alps, taking the train to Interlaken with the simple goal of seeing mountains! Sure we were going to miss the Matterhorn, but we didn’t want to miss the Alps entirely. After all, there are toboggan runs out there that take an hour to complete. An hour! That’s something like 9 miles in one long run! Sounds totally amazing. But, of course, not running while we were there. Sigh. They open next weekend if you’re interested. With our options limited, we enjoyed a very pretty train ride into the countryside. Juuuust make out the three big peaks of Eiger, Monch and Jungfrau. Next week you you can supposedly take a tram and gondola up to the “Top of Europe” view point and see big, BIG Alps over Interlaken. That’s all closed down for a few more days, so a hike seemed like the best option. Into the foothills! As we hiked we came to the top of a toboggan run that was closed, but there was a play area so we gave it a go! Aaron made it look really easy. 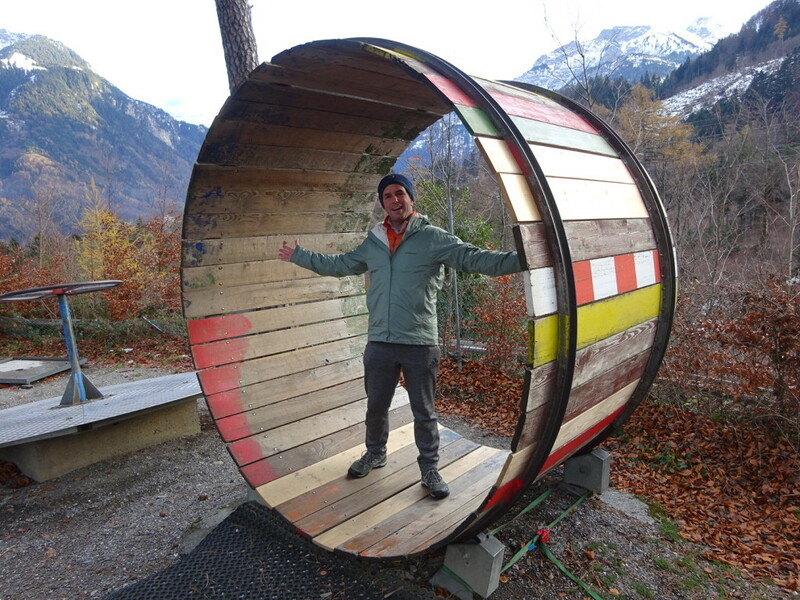 Maybe he’s made for a hampster wheel! I’m not! I took one step, lost my balance and fell face first …laughing the whole way. I gave it a very brief second chance and called it a day. Maybe we’re lucky everything was closed because we really enjoyed our chilly, hilly, little trail walk. We kept saying “we should get back to the train…but not until we go around that next bend…” And that’s how you end up hiking until it’s nearly dark out. 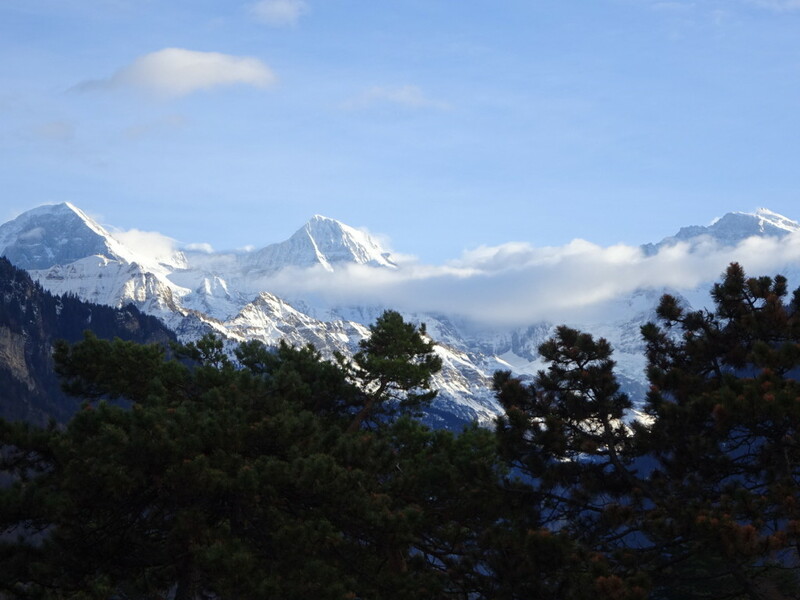 It’s also how you see gorgeously snow covered Alps at sunset; a sight we’ll not soon forget. It was breathtaking! I don’t think this really shows it so well, but the sun setting over the Alps during our hike was spectacular. We loved getting out to the mountain village so much and it was totally worth getting there to see the mountains at sunset. So grab the list and check off seeing mountains. For the record, we can now proudly say we hiked in the foothills of the Alps. Not. Too. Shabby! Art pops up in unexpected places. 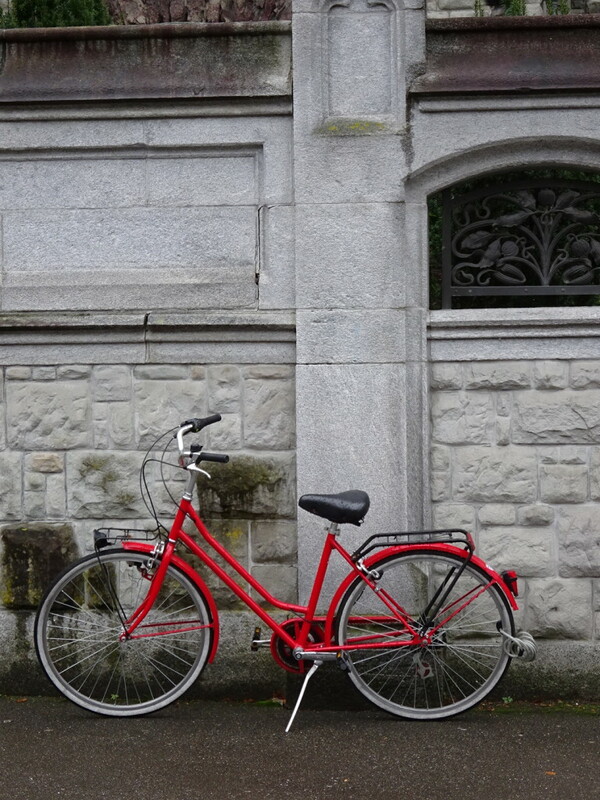 A parking lot in Interlaken. 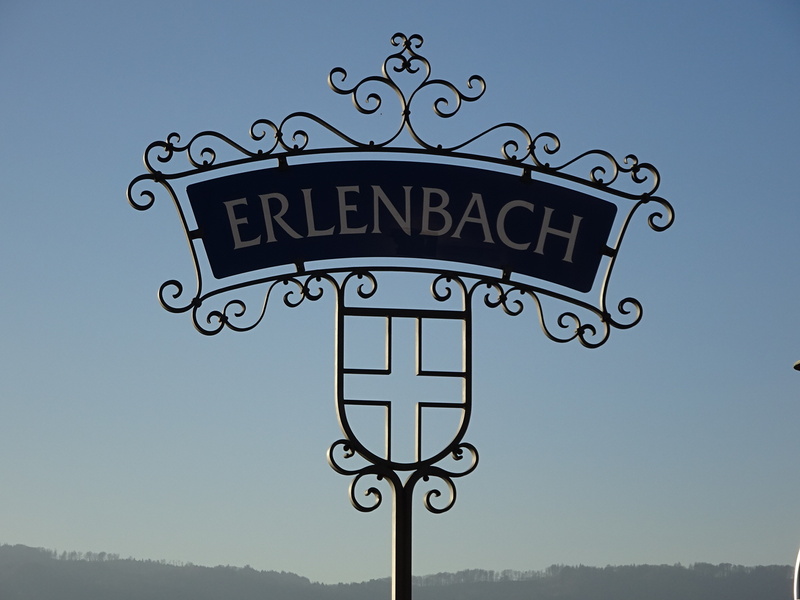 On our final day we took a ferry from Erlenbach to Zurich – a spectacular ride on an absolutely gorgeous day. We were accompanied by Matt, Christy and the kids. So check that box, too. 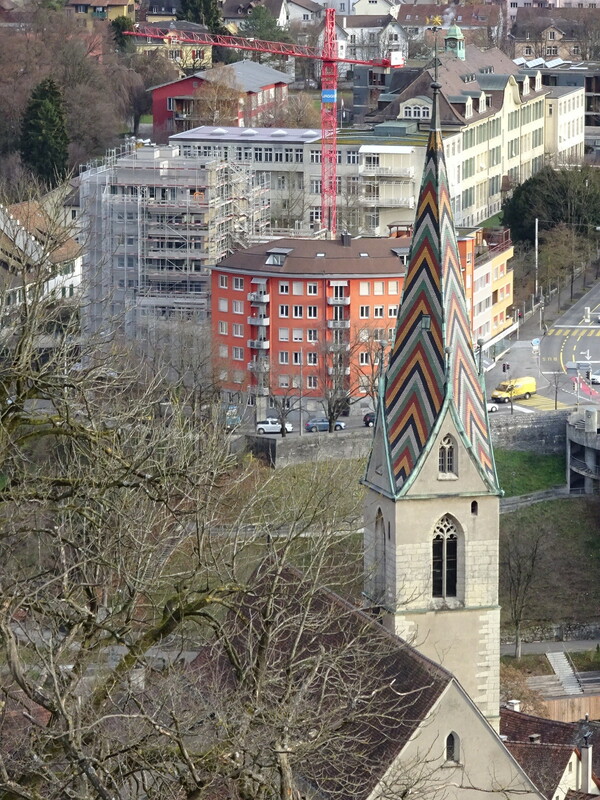 The two thing they can’t charge you for in Switzerland – the people and the views. Fantastic! Now THAT’S a ferry dock sign! A beautiful day for a ferry ride across the lake. 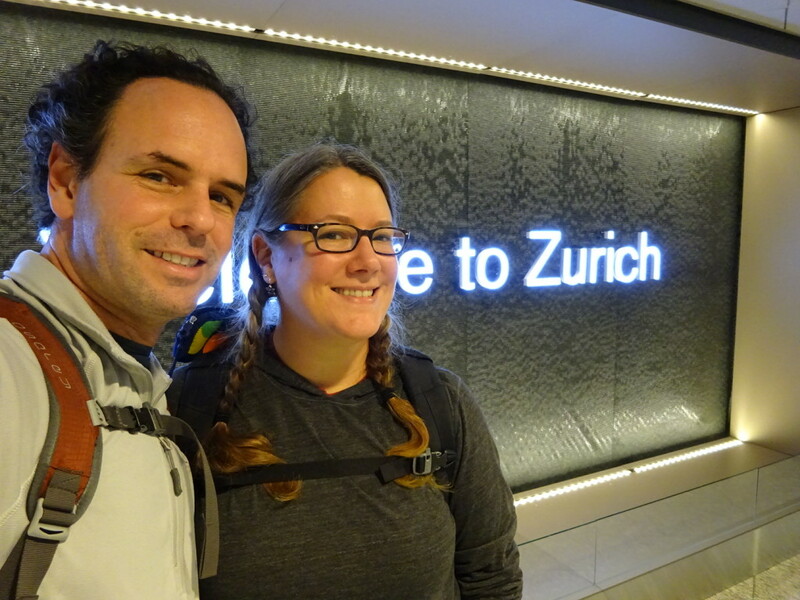 And just like that our 5-day visit to Switzerland was finished. Time to pack up and head back to Spain for our next house-sit. 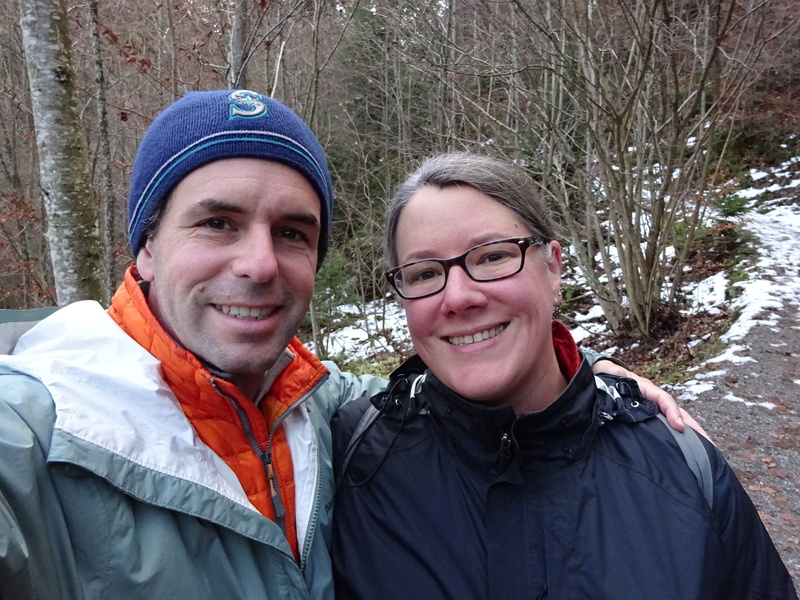 We had a great time seeing our friends, eating chocolate, and hiking in the foothills of the Alps. Even when everything is closed, Switzerland turns out to still be a fabulous place to explore! 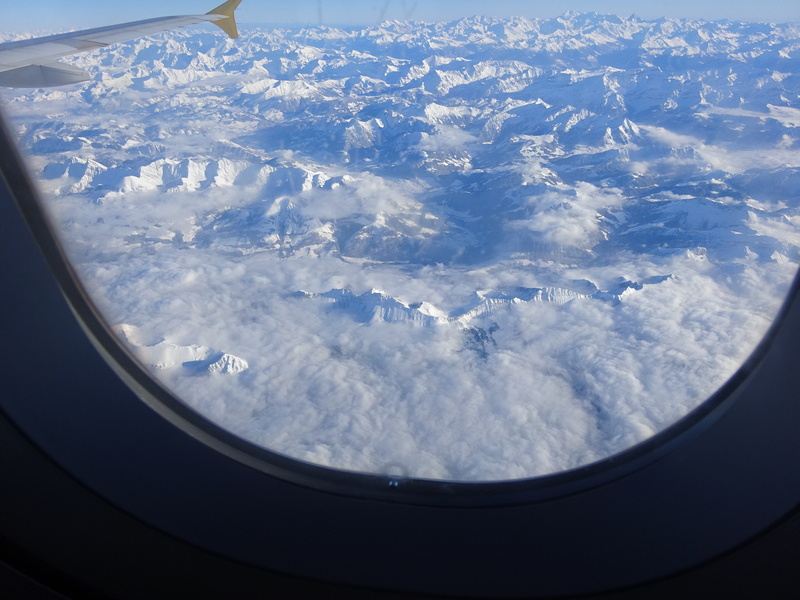 The Alps from way up high. Sooo many connections in this small world of ours. PS. I forgot to mention how impressed I am with your balance and agility on the hamster wheel. One more skill perfected on the trip! Hah! I’m sorry that these blogs are nearing an end. I look forward to them and thoroughly enjoy traveling with you both. I like your input also Casey. May the New Year bring you all good health and safety. There are still many blogs to come before the trip itself ends. And, hopefully, we’ll continue blogging once we’re back – the adventures will just be a little closer to home. Happy New Year to you, too!!! We will gladly host you the next time you visit Europe in Germany, so you don’t have to spend so much money! But glad you discovered the good chocolate.